Myra: Given the surreal nature of the book, I thought that a non-linear collaborative blogpost with Fats might do it justice. The great thing about publishing online is that you can be as creative as you wish – within boundaries, of course. Thus, we attempt our very first ‘integrated thought-bubble’ to share with you how The Arrival has moved us in various ways. This would be non-sequential, punctuated with our attempts at poesies and painted images, and a celebration of non-sequiturs. Thus if you are looking for a summary, a plot, a logically-sequential narrative, alas, we promise to disappoint you. Fats: When Myra came up with the idea of a collaborative post on Shaun Tan’s The Arrival, I had my own doubts not because I didn’t think it would be possible but because GatheringBooks has never been this busy. 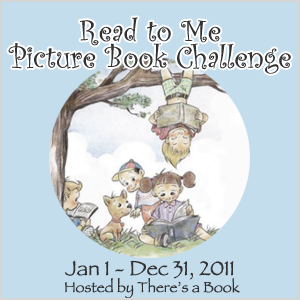 Tons of wordless picture books, panel discussion preparation, GB anniversary planning, free books for reviews, work and school overload, moving into a new place—you name it. Yet, somehow, we were able to make room for Shaun Tan’s masterpiece. 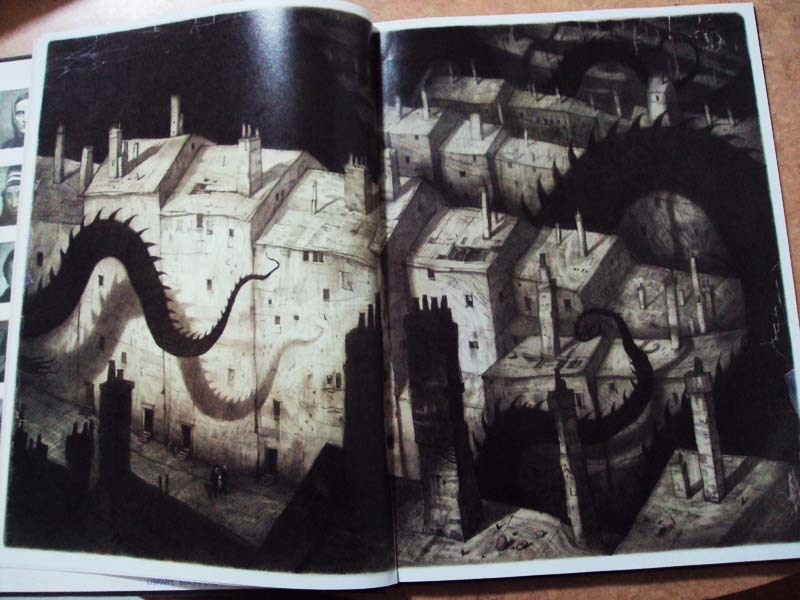 I found out about Shaun Tan when Myra mentioned him in one of our random conversations. 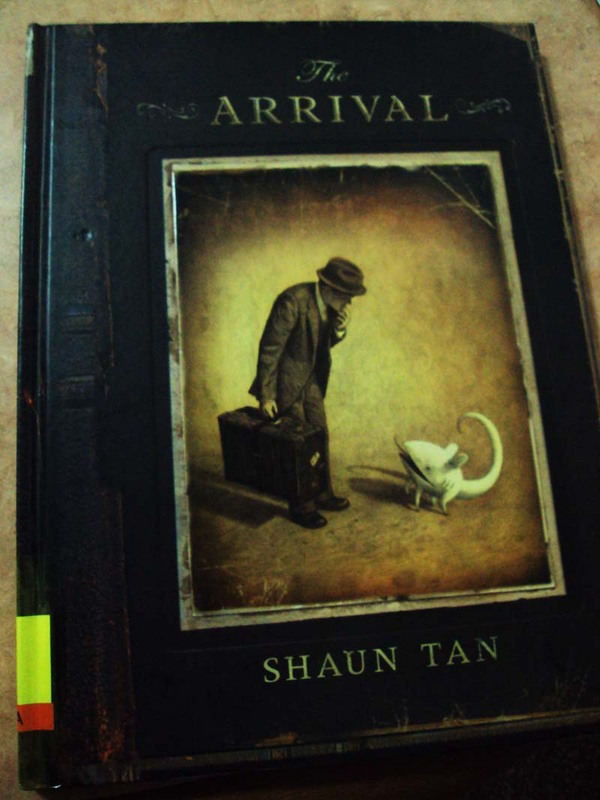 If memory serves me right, Shaun Tan’s The Arrival was the inspiration for our wordless picture book theme for the months of March and April. (you are absolutely right, dearest Fats) I remember grabbing the only copy of The Arrival on the graphic novel section of Borders last January. While I enjoy paying less than what the book is actually worth, I don’t mind spending a few extra dollars for something that deserves a spot in my immaculate bookshelf. Passing of the Seasons Marked by Cloud Patterns and Skeletal Flower [borne out of a leaf] Half-buried in Snow. The images found here in this page struck a chord in me and made me sing. Myra: I find that if one articulates the visual narrative of Shaun Tan, one ends up with poetry, snowy music, paintings sculpted by unseen hands in multiple shades of sepia. I am particularly taken by this image which begins with a leaf and ends in this fragile skeletal structure of a flower buried in snow – signifying the passing of time. It marks the space and distance creeping slowly, easing its way towards that time when our male protagonist is reunited with his family. Shaun Tan’s visual eloquence renders words unnecessary as the strands of time are woven out of its fabric through the gradual change in each image across different seasons. How about you Fats? Any favorite image? Fats: All images in The Arrival carry in themselves a certain touch of charm and beauty. 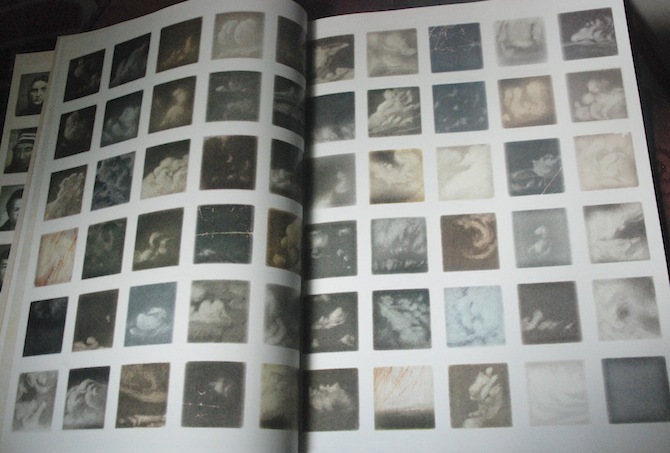 One of my favorite images is the two-page spread of cloud patterns. As I have mentioned in my review of David Wiesner’s Sector 7, I have a fascination for clouds that I cannot explain. If clouds have a mind of their own, they would have been grateful for Shaun Tan for having been well represented. 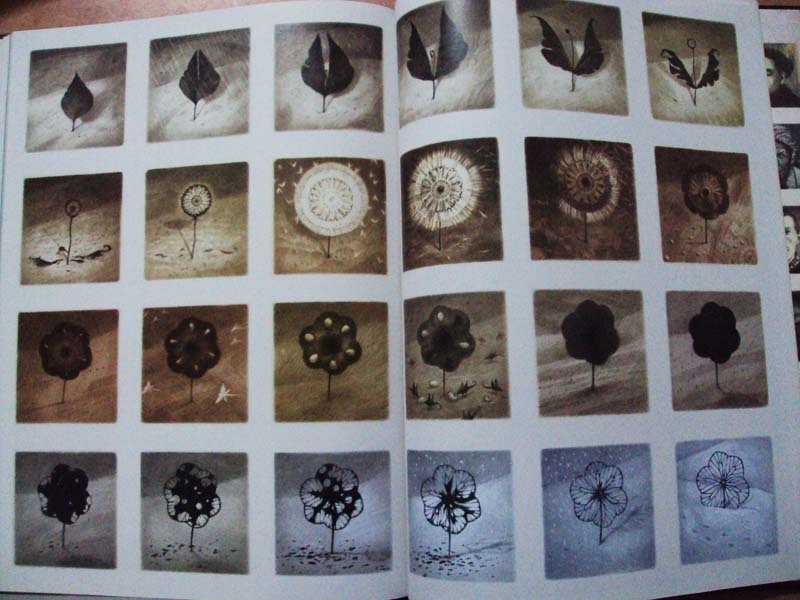 I like how Shaun Tan used the snapshots of cloud patterns to highlight the passing of days, if not seasons. Moreover, the clouds appear to be firsthand witnesses to the migrant experience as they oversee the immigrants traveling in a ship across the ocean. Ports of Entries – Ellis Islands of the World, Human Geese Flying South. The Immigrants by Lowenstein Wendy and Loh Morag. Click on the image to be taken to the websource. Myra (cont) I was personally reminded of the recent blog post I made on Letters from Rifka by Karen Hesse where I also shared quite a number of pictures from Ellis Island as based on Rifka’s story of migration as evidenced through her letters. The images as clearly seen below highlight that sense of unfamiliarity in a foreign land: the need to be tagged, classified, poked and prodded to determine whether you are indeed suitable for your host country – your hair checked for lice, your skin for infectious diseases, your mouth for bacteria. I am perhaps fortunate in the sense that the zeitgeist of the present time allows for greater fluidity as citizens become more transnational. International travels are perceived as a matter of course rather than a matter of national threat (at least for most cases). While it allows for greater flexibility (again in some cases), it also carries with it a host of emerging problems with the concept of citizenship questioned, and ‘multiculturalism’ being a byword – with very few well-meaning people understanding what it truly means. My port of entry was Hawaii, and it seemed like it was only yesterday when I arrived in the United States. It was a day to remember, not because I have finally set foot on American soil, but because I almost did not make it through the immigration counter, all thanks to the fake silver ring on my finger! All silliness aside, Shaun Tan’s visual narrative reflects the emotional distress experienced by immigrants as they try to make their way to an unfamiliar place where their future is without certainty. “In ‘The Arrival’, the absence of any written description also plants the reader more firmly in the shoes of an immigrant character. There is no guidance as to how the images might be interpreted, and we must ourselves search for meaning and seek familiarity in a world where such things are either scarce or concealed. Words have a remarkable magnetic pull on our attention, and how we interpret attendant images: in their absence, an image can often have more conceptual space around it, and invite a more lingering attention from a reader who might otherwise reach for the nearest convenient caption, and let that rule their imagination. having come across it for the first time while thinking about my migrant story. In silent pencil drawings, Briggs describes a boy building a snowman which then comes to life, and is introduced to the magical indoor world of light-switches, running water, refrigeration, clothing and so on; the snowman in turn introduces the boy to the night-time world of snow, air and flight. The parallels between this situation and my own gestating project were very strong, so I could not help reading the silent snowman and small boy as ‘temporary migrants’, discovering the ordinary miracles of each other’s country in a modest, enchanting fashion. It also confirmed the power of the silent narrative, not only in removing the distraction of words, but slowing down to reader so that they might mediate on each small object and action, as well as reflect in many different ways on the story as a whole. Myra: Among the immigrant stories I visually celebrated, I was moved by the wordless sharing of the old man with the cone hat. I figured he was a soldier. When all is done. Pyrrhic Victories and a Missing Leg with Ancient, Pain-filled Eyes. I send a silent prayer (pixie dust, four leaf clovers) to warriors far from home, skillfully weaving their way around sandstorms, their hearts in their throats, photos wiped away from their PCs to remove all traces of their identities – treading dangerously on the boundaries of a war that we only read about in the papers and that which they live through on a daily basis – may they find their way home (wherever it may be) with all digits, limbs, heart and mind intact. Fats: I agree with you, Myra. Indeed, that scene was heartrendering. The wounds of war never fully heal. He was a soldier who fought hard and he carried the burden of war all his life even after it was over. The impact of war is beyond measure. It is an atomic bomb that wipes out generations and generations of people. 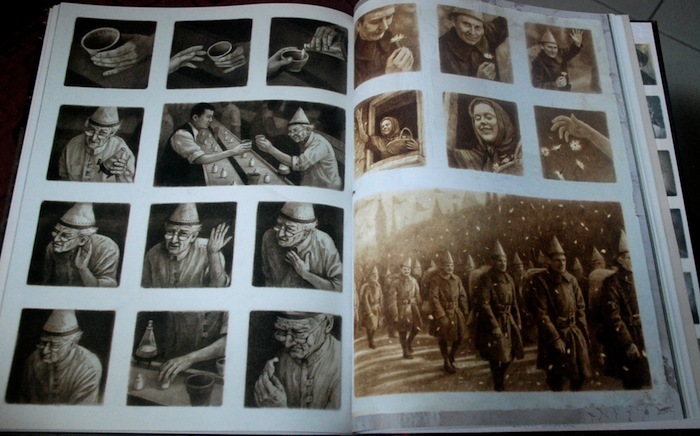 What is worth noting in the old man’s story is Shaun Tan’s skillful way of using shades to alter the “mood” of the story. If you noticed, the old man’s story started in sepia, when he was just starting his career as a soldier. 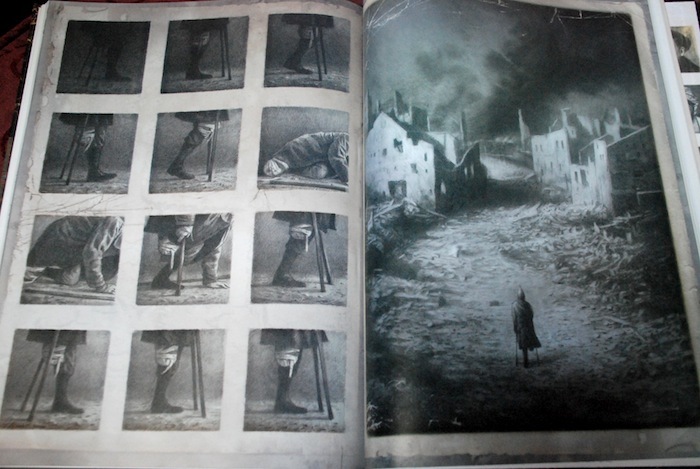 As the story progressed and war took place, the sepiatoned images slowly turned into shades of grey, depicting images of skeletal remains piled up on the charred and ash-covered ground. What I also liked about Shaun Tan’s work is the blow-by-blow, scene-by-scene snapshots that outline the details of the story. Still on the old man’s story, I liked the series of images portraying the crippled old man, how he fell on the ground but slowly got himself up again. 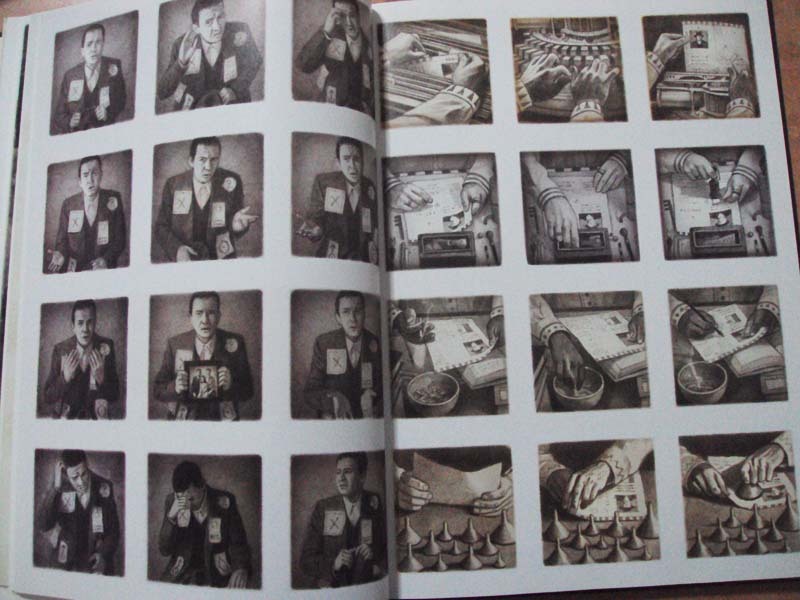 Shaun Tan successfully tells the story using polaroid-like images that also bring to mind stop-motion animation sequences. The makings of a tale-within-a-tale in this book is trully spellbinding. Somehow, it reminds me of Mitch Albom’s Five People You Meet in Heaven. Each of the characters that the protagonist meets in The Arrival has his own migration experience to share. Reading the book made me realize that the definition of “migrants” is not limited to people moving into another country. Escaping from the harsh realities of life is a feat to accomplish. Each of the characters “escaped” from their own reality and started a new life somewhere, not necessarily another country. It may be another town or city. Every time I hold The Arrival in my hand, I feel like I’m holding a precious, nowhere-near-wornout-but-still-age-old family heirloom. I flip through the pages and I see an entire life spread out in front of me. The pictures do not just tell stories; they share a history of people, a certain commonality that binds us all. We are, after all, migrants across the universe. Family Packed in a Suitcase and Celebrating Home Amidst Flying Paper Boats. This image here is unforgettable. 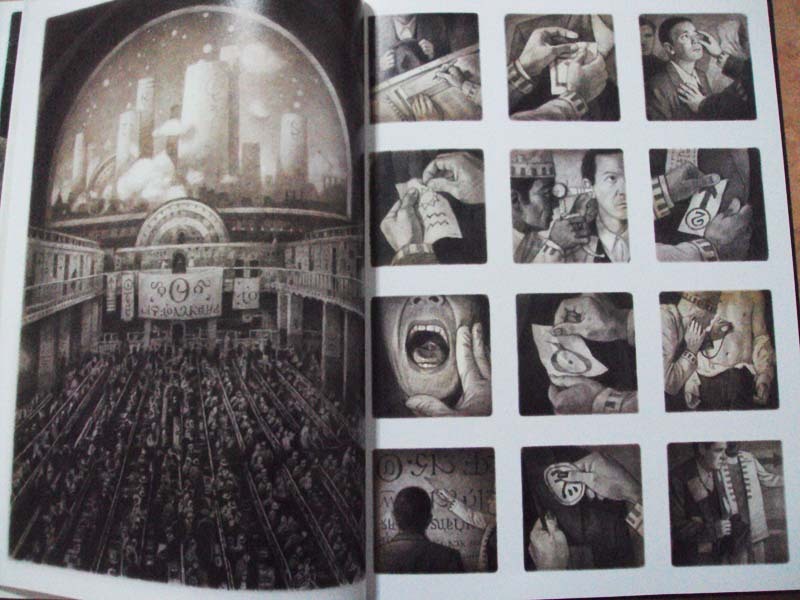 Myra: I am moved by this inspired image by Shaun Tan. The parallels between a music box and ‘family packed in a suitcase’ is simply mind-blowing. Again it brings to mind some of the key issues I’ve raised in my review of Jeannie Baker’s Home/Belonging and Window about finding a sense of ‘home’ within and knowing one’s place in the world irrespective of one’s country of origin. Allow me to quote once again from Shaun Tan himself (source here) as he talks about his own experience of ‘where one comes from’ – a fairly-common question asked of my nephews in the States who are born there and for all intents and purposes American Citizens, yet borne of Filipino parentage. Fats: I remember crying myself to sleep on my first week in Hawaii and my first few nights in California. (Yes, I’m an emotional junkie.) While it is true that I have adapted quite well over the years, I continue to face the “problem” of belonging. Job-hunting in America is different from that in the Philippines (then again, I didn’t really experience this back home). Education is the same way. And, as Myra had mentioned, relationships. Having an Italian-American boyfriend is a mini- challenge in and of itself. Rice is a staple food in the Philippines so, of course, I love it to death. Unfortunately, Mikey is not a big rice-eater even though he grew up in a farm. There would be days when we would “argue” over my rice intake. I tried to explain to him the Asian part of me in case he failed to notice, that I cannot live without rice, and that I’ll go through withdrawal without eating rice for 3 or more days. LOL. Luckily, he doesn’t mind trying Filipino food and ends up liking most of them. Still, the rice remains an issue to this day. Digressions aside, everyone will have the “problem” of belonging, immigrants or not. I remember an essay I wrote in my English class back in college. I wrote that each is an alien to his own place. It does not matter where you are in the world, because even when you’re back “home,” you will still face the same dilemma. I guess part of “belonging” is man’s continuous search for contentment. It seems that we will find belongingness when we are fully content with our lives. Here is a list of the awards received by this book as sourced from Arthuralevinebooks.com. It is not surprising then that there are quite a number of resources available for this graphic novel. Let me begin with a few comprehensive reviews written about the book. This link shows the New York Times Sunday Book Review of The Arrival entitled “Stranger in a Strange Land” as written by Gene Luen Yang. Another exhaustive post is from Caviglia’s Cabinet of Curiosities while this thoughtful review is from Saffron Tree. It is also interesting to note that there is a film and theatre adaptation of this book as could be seen in Shaun Tan’s website. Absolutely stunning theater production. It was also well-received and was named ‘Best Production’ for 2006 at the Perth Theatre Trust/Actors Equity Guild Award. In this website created by Australia’s Department of Education where there is support provided for specific titles and authors for teachers, one can also find this downloadable PDF link which is from CMIS Focus on Fiction site (Fiction Focus, Vol. 21, No. 1, published in 2007) which contains a detailed article on how students found the book as well as how it can be used as a valuable resource for English teachers. I also liked reading through this Guest Post from Drawing Words and Writing Pictures website where an English teacher from Cambridge England talked about discussing The Arrival in a secondary school English class. This downloadable PDF link created by GardensTheatre in Australia is an 8-paged, highly exhaustive Teacher Notes on the use of The Arrival alongside a curriculum framework that makes use of in-class activities as well as discussion questions after the theatre version of the book has been viewed by the students. My favorite, though, is this downloadable PDF link by WindyHollowbooks which talks about not just The Arrival but also quite a number of Shaun Tan’s artworks such as The Bird King, and Tales from Outer Suburbia. 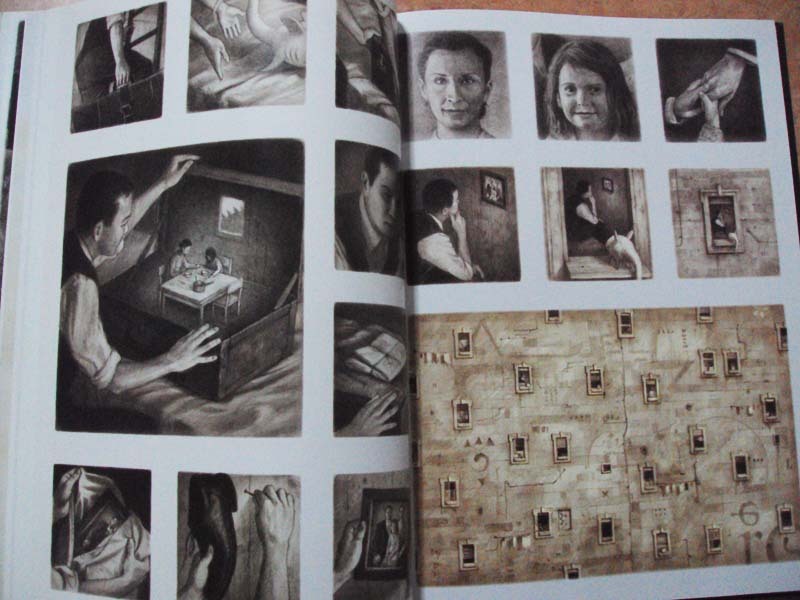 What I like about this post is its incisive ability to tease out the Visual Literacy Discussion Points, the themes in Shaun Tan’s artwork, and an outline of Language and Literacy Extension activities for students. This portrait of Shaun Tan is sourced from Cheryl Rain Field’s Blog. Click on the image to be taken to the websource. Shaun Tan was born in Perth, Western Australia in 1974. His talents as an artist were recognized when he started attending school as a child. He also painted images for science fiction and horror stories in small-press magazines as a teenager. He graduated from the University of WA in 1995 with joint honours in Fine Arts and English Literature, and is now working full time as a freelance artist and author in Melbourne (source here). Click here to be taken to his official website. I have also taken it upon myself to build this collection of video clips of Shaun Tan interviews as done by Hachette Australia. I believe that it would provide a clearer picture of what it was like for him to have created this piece of work that he dedicated to his parents. Enjoy! The Arrival by Shaun Tan. Arthur A. Levine Books, an Imprint of Scholastic, Inc. 2006. Book borrowed from the NIE Library. Thanks for writing, and for the link to your site, I really appreciate it. I’m travelling at the moment (as I often am these days), but have been able to read good chunks of your discussion and find it fascinating, and of course very appropriate as my books are ‘alive’ only when they stimulate a much larger conversation, and ideally a personal one. The Arrival, in particular, has been far more successful in this respect than I could have ever imagined, the response has been quite staggering. I suspect that with all of your links and cross-referencing, your review possibly IS the definitive one 🙂 Thanks again for putting it all together.